Initialize search field of a UIDocumentPickerViewController? 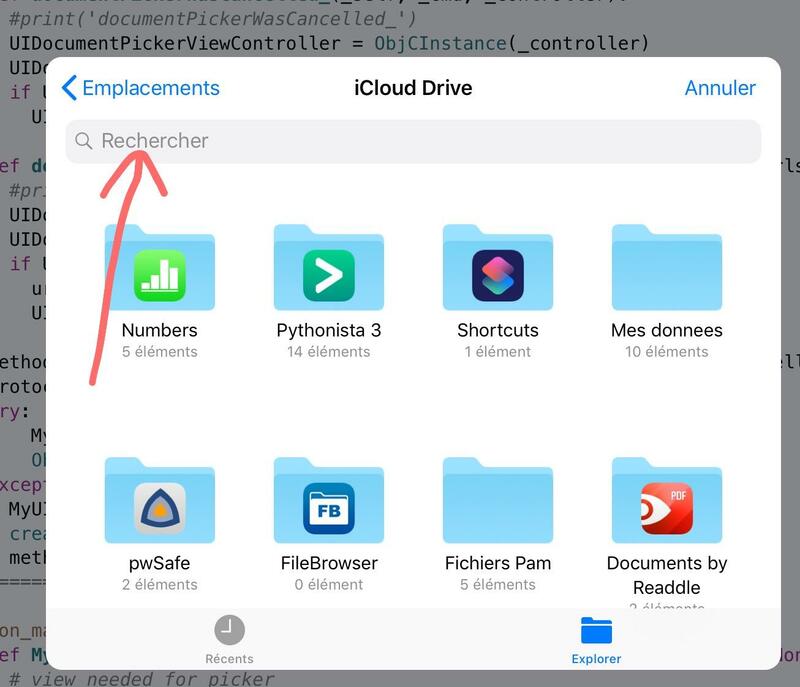 Question for big guru(s): is it possible to initialize the search field of a UIDocumentPickerViewController? You might take a look at my viewbrowser, and have it display right after presenting the picker. Then you can find the search bar in the view heirarchy. Or play around with dir(), or my objcbrowser to find if it exposes the searchbar in the view controller. @JonB Thanks to try to help me. I just installed your both tools but I don't understand how to use them. iirc UIsearchController has a searchBar property, which returns a UiSearchBar, which then has a .text property that should be settable, perhaps on_main_thread to be safe. @JonB If you have time to spend, this is my script. Anyway, thanks a lot as usual for your advices. I'll give it a try - though I managed to erase my entire pythonista install, so have to reinstall my various wrench scripts etc. @JonB Ok, thanks a lot to have spent time for this problem. there is a small chance that you can create a UITouchEvent, and send that to the _UISizeTrackingView or whatever it is called (thats the one that responds to hitTest_withEvent).